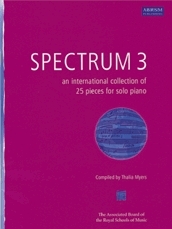 In 1995, in response to the dearth of serious contemporary music playable by good amateur and student pianists, Thalia Myers commissioned the first of the enormously successful, award-winning Spectrum anthologies. Published by ABRSM (Publishing) Ltd in 1996 and followed by Spectrum 2 (1999), Spectrum 3 (2000), Spectrum 4 (2005), Spectrum for Piano Duet (2012) and Spectrum 5 (2016), these one hundred and seventy seven pieces in six volumes have been set for competitions and examinations, used as reference works by professors of composition and entered the repertoire of student, amateur and professional pianists around the world. 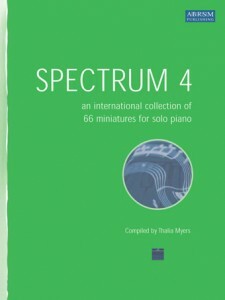 Thalia Myers has recorded CDs of Spectrum and Spectrum 2 on NMC DO57, Spectrum 3 on MET CD 1053 and Spectrum 4 on USK 1227CDD. 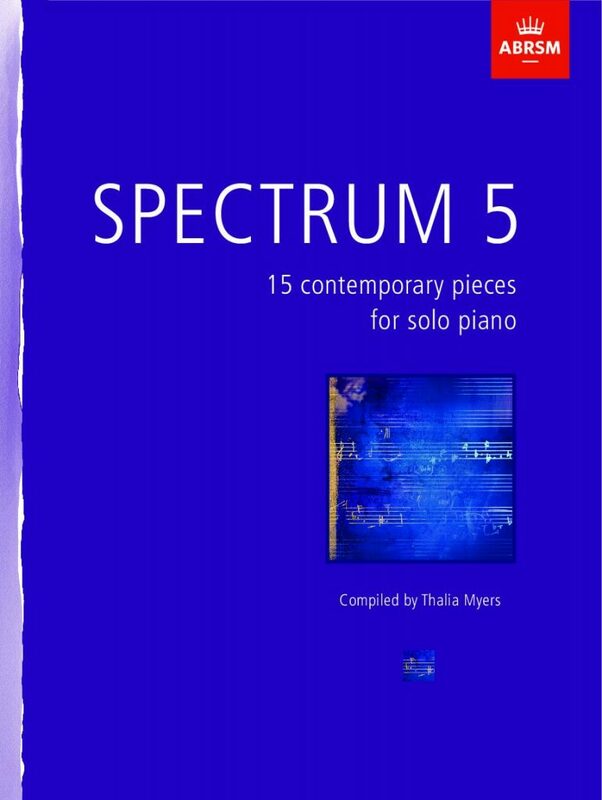 The recording of Spectrum for Piano Duet, in which Thalia is joined by pianists Timothy Salter and Edward Liddall, is on a CD attached to the published volume and her recording of Spectrum 5, USK 1233DL, is available for download (only) from sites including Amazon, iTunes and ABRSM. 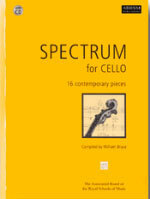 Spectrum for cello, compiled by William Bruce, and Spectrum for Clarinet, by Ian Mitchell, were published in 2004 and 2006 respectively. The accompanying CDs, in both cases, were recorded by the compilers together with Thalia Myers. 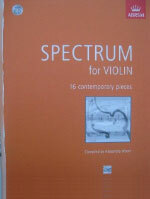 Spectrum for violin, compiled by Alexandra Wood, with whom Thalia Myers has also recorded the anthology, was published in 2009. 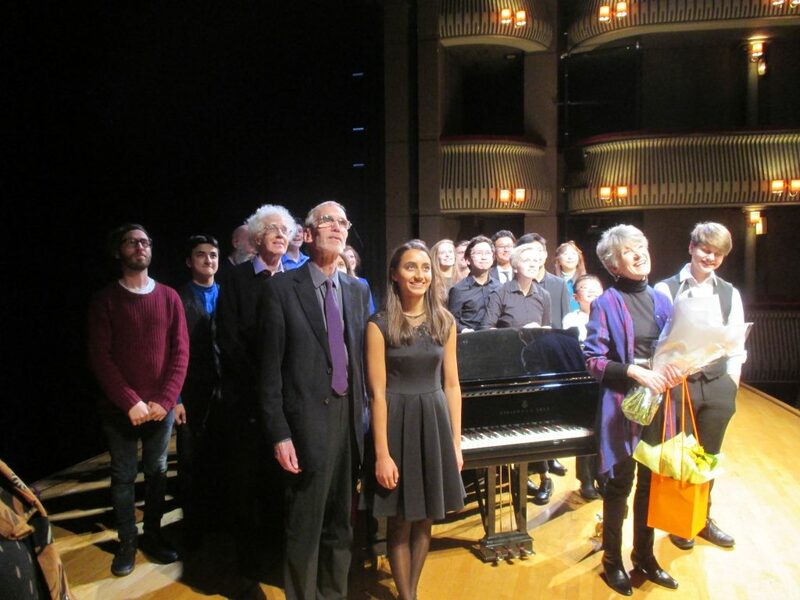 Launch of Spectrum 5, Britten Theatre, Royal College of Music, London, 5 November 2016: composers and performers with Thalia Myers. 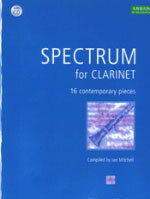 The following composers contributed to Spectrum: Eleanor Alberga, David Bedford, Diana Burrell, Philip Cashian, Brian Elias, Michael Finnissy, Graham Fitkin, Michael Zev Gordon, Jonathan Harvey, Alun Hoddinott, Gabriel Jackson, Stephen Montague, Anthony Payne, Roger Redgate, Jeremy Dale Roberts, Edwin Roxburgh, Timothy Salter, David Sawer, Howard Skempton, Andrew Toovey. All the above composers contributed to Spectrum 2 as well as the following: Avril Anderson, Julian Anderson, Richard Rodney Bennett, Laurence Crane, Neil Kaczor, Eddie Mcguire, Colin Matthews, Barry Mills, Dave Smith, John Tavener. The following composers contributed to Spectrum 3: Javier Alvarez, Gerald Barry, Sylvie Bodorova, Victoria Borisova-Ollas, Lyell Cresswell, Detlev Glanert, Naji Hakim, Haflidi Hallgrimsson, Faidros Kavallaris, Joyce Bee Tuan Koh, Ramon Lazkano, Alexandre Lunsqui, Toek Numan, Peteris Plakidis, Poul Ruders, Aulis Sallinen, Peter Sculthorpe, Rodney Sharman, Jean-Marc Singier, Karen Tanaka, Sohrab Uduman, Param Vir, Kevin Volans, Julia Wolfe, Julian Yu. Many of the above composers have also written pieces for Spectrum 4. Contributing for the first time were Simon Bainbridge, Snorri Sigfús Birgisson, Michael Blake, Martin Butler, Chen Yi, Barry Conyngham, Janet Davey, Beat Furrer, Daniel Giorgetti, David Gorton, Julian Grant, Alejandro Guarello, Giorgos Koumendakis, Elena Langer, Siaw Kin Lee, Permagnus Lindborg, Roderik De Man, Peter Maxwell Davies, John Mcleod, Eric Moe, Pavel Novak, João Pedro Oliveira, Hilda Paredes, Ananda Sukarlan, Giles Swayne, Tazul Tajuddin, Jesús Torres,Erkki-SvenTüür, Mindaugas Urbaitis, Alejandro Viñao, John White, Adeline Wong, Raymond Yiu. 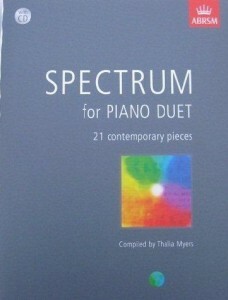 Spectrum for Piano Duet composers are Jeremy Dale Roberts, Janet Davey, Gabriel Jackson, Roderik de Man, Naomi Pinnock, David Sawer, Howard Skempton, Victoria Borisova-Ollas, Michael Finnissy, Graham Fitkin, Terry Mann, Patrick Nunn, Sadie Harrison, Timothy Salter, Simon Bainbridge, Philip Cashian, Andris Dzenitis, Helen Grime, Phillip Neil Martin, João Pedro Oliveira, Arvo Pärt. The following composers (all of whom were, at the time of commissioning, outstanding music students at either a conservatoire or university in the UK ) each contributed a variation on the duet by Howard Skempton: Mark David Boden, Ryosuke Karaki, Thomas Oehler, Daniel Parcell, Graham Ross, James Long. Spectrum 5 contains pieces by Gabriel Jackson, Graham Fitkin, Poul Ruders, Karen Tanaka, Howard Skempton, Harold Meltzer, Huw Watkins, Victoria Borisova-Ollas, Michael Finnissy, Gavin Higgins, Timothy Salter, Cheryl Frances-Hoad, Helen Grime, Chen Yi and Philip Cashian.